’Tis the season for wool: sweaters, mittens, hats, scarves—and yes, ’tis the season for sewing with wool too! Imagine curling up on the couch, hot coffee or tea nearby, needle, thread, and fuzzy bits of wool at the ready. We want to go to there! All for Fall author Bonnie Sullivan knows a thing or two about working with wool. She knows a lot about fabrics that behave like wool too. Bonnie designed her Woolies Flannel line of fabrics with Maywood Studio to look like wool, but they sew, piece, and wash like quality cotton flannel because they are flannel! You’ll find classic herringbones, plaids, and tweeds—those fall-inspired fabrics you want to cozy up in as your feet crunch along leaf-laden sidewalks. Bonnie’s way of doing wool appliqué couldn’t be simpler—she’s got a few tricks up her (flannel) sleeves! One of them? Fusible web, which not only makes appliqué a breeze; it also prevents edges from unraveling. To whisk you into the spirit of the season, we’re sharing Bonnie’s fusible web for wool appliqué how-to from All for Fall below. Read on and you’ll see what we mean by simple! Wool appliqué is easy and so much fun. Over the years, I’ve tried many different ways of preparing the pieces for appliqué and many different stitches, and I’ve settled on the following techniques. 1. Patterns are reversed for use with fusible web. Trace the patterns onto the paper side of lightweight fusible web, and cut out the shapes roughly ⅛" to ¼" outside the traced lines. 2. Place the paper shapes on the wrong side of the designated fabric and fuse in place following the manufacturer’s instructions. Cut out the pieces on the lines. 3. Peel the paper off the shapes and arrange them on the appropriate fabrics; press to fuse the shapes to the fabric. When using fusible web with wool, you may have to give it a little more time and pressure to make sure the heat goes through the thick wool, especially when there are multiple layers. Because the wool is thick, pressing from the back after you’ve pressed the front will help the glue to adhere. 4. Stitch the shapes to the fabric as described in the project instructions. On most of my projects I use a simple whipstitch to further secure the appliqué shapes to a background fabric. Blissfully simple, don’t you think? Even those of us who think we’re allergic to appliqué can go pro with Bonnie’s approach! And speaking of the fine Woolies Flannels that Bonnie designs . . . our friends at Maywood Studio sent us a generous heap of them to share with one lucky winner today! 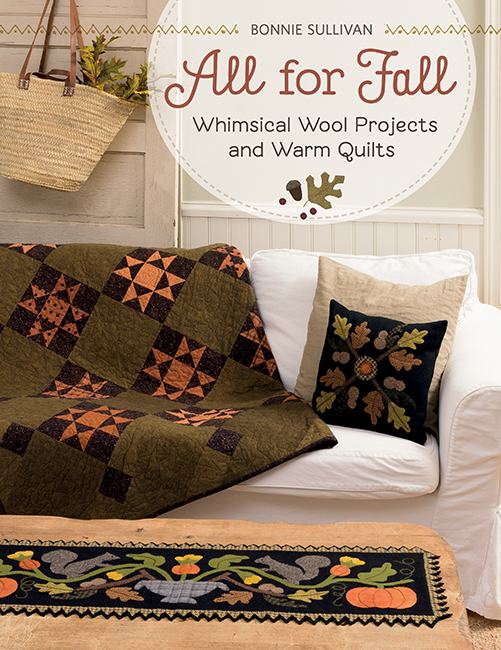 One winner will receive three Woolies Flannel charm packs, one Irish Chain Quilt kit, and one 12-Block Log Cabin Quilt kit from Maywood Studios plus a copy of All for Fall! What kind of stitch do you use when appliquéing with wool? I use a whipstitch, just like Bonnie. I prefer a blanket stitch. I’ve never tried wool appliqué, but I’m ready to give it a try! We’ll choose a winner one week from today and let you know by email if you win. Good luck! And if you’re ready to stitch for fall with Bonnie, you can order All for Fall at our website and instantly download the eBook for free. We’ll email you about your prize, Sheila—congratulations! I’ve never tried wool applique but I want to try! I have used a buttonhole stitch when doing regular applique and love it. I’ve never tried will applique,but I’m ready to give it a try! I use both buttonhole and whipstitch depending on the size of the piece being sewn. I just love this. I have embroidered some when I was a kid. I am excited to try wool appliqué. I have used a whip stitch I tried the buttonhole but didn’t care for it as much. Would love to win this prize!! I have never tried wool applique but I am willing to give it a try! I prefer a buttonhole stitch. I have never done wool appliqué but would love to try it! I’ve never tried wool applique, but I’m ready to give it a try! I also use the whip stitch. I have mostly used the buttonhole stitch but have been morphing into using just the whip stitch. I think it is giving a cleaner look. I like using the button hole stitch when doing applique. I prefer the buttonhole stitch, love the look it gives! I like to use the buttonhole stitch. Buttonhole stitch is my favorite! I used buttonhole stitch when I tried wool applique. I love Bonnie Sullivan’s patterns. I have not tried wool appliqué, but would love to try it. I like the Whipstitch as well as the button hole stick. I think it would depend upon thread color or contrast which method I would use. I have always used the buttonhole stitch but I just may try using the whipstitch. It looks like it would be less noticeable. I love doing appliqué! Oh, please, please pick me! I LOVE Bonnie so much! Her woolie flannels are the best thing on the market! I use them all the time and they are my favorite quilts to snuggle under!!! I have to admit I do 99% of my wool applique by machine now using the blanket stitch. I love using her flannels as backgrounds for my real wool applique too. Keep up the wonderful designs Bonnie! I have not tried wool applique but with these patterns, I am ready to try it. I am new to wool quilting, love it so far. I have tried both stitches. I use both. Depends on the project. I use whip stitch and buttonhole stitch. I have used the whipstitch on regular hand applique but I am just now getting interested in wool applique and am very excited about trying it. Want to try the blanket stitch too. I use blanket stitch when working with wool, I like the finish it gives the edges. Always use Whipstitch! Love Bonnie’s designs and have made several projects. I have used the blanket stitch for applique but will attend a class on Wed to learn hand applique to learn a hidden stitch. Hi! I like to use a blanket stitch. I just think it’s pretty! Thanks for this chance to win, love this book! I have used the buttonhole stitch. I’ve used both blanket stitch and whipstitch. Whipstitch is easier but sometimes I want the look of blanket stitch. I have been wanting to learn how to do wool applique and love your great directions and pictures how to do it. I’m excited to try it. I try to sew every day and love it!!! I have never tried wool applique but the instructions here have me confidence that I can do it! I use whipstitch for appliqués. I don’t often work with appliqués but would love to learn new techniques and use it more often. Winning materials to try would be fantastic. I love the way a blanket stitch looks depending on the project, otherwise I use the whip stitch. I can’t wait to get this book and would love the fabric. Thanks for the chance. I use both! Love Bonnie Sullivan patterns and Woolies flannel. I currently use a buttonhole stitch, but will give the whip stitch a try in my next project. I’ve never done wool applique but I am ready to give it a try! I have tried wool applique. But I need to practice sewing it on. I like a blanket stitch for the edges. Like the instructions given. I’ve not done wool appliqué but would like to try! I like using a blanket stitch for the outside edges. I use both whip stitch and buttonhole stitch. It just depends on what I’m stitching… I’d love to stitch with Bonnie’s fabric and patterns! Pick me!!! I LOVE Bonnie, her designs and especially her Woolie Flannels! I have used lots of them and those quilts are my absolute favorite to cuddle under. Even my cat prefers Woolie Flannel Quilts! I do most of my Wool applique on the machine now. It’s so much faster and allows me to do more projects. I use the blanket stitch on the machine and by hand when I get the time to do it that way. Love this book! I use a whipstich. I Love working with wool applique. button hole stitches. Looking forward to learning more! I have never tried wool applique and learning how with a book and fabric bundle would be awesome! Never done appliqué but I a so ready to give it a try!! I prefer the blanket stitch which I sometimes do by machine. I truly love wool applique, but don’t do it enough. I have used the buttonhole stitch, but have been trying whipstitch. Mostly I use the buttonhole stitch to do the edges. But I use multiple stitches on the inside and around the appliqué items. For very small pieces I usually attach with one or more French knots. I have several very old books on different embroidery stitches that I use for reference. Generally the stitches work just as well for thicker threads. And sometimes I just make them up. Fun! I love a buttonhole stitch! But as I do more wool appliqué and am starting to learn more decorative embroidery stitching, I first use a tiny whip stitch to anchor my wool in place, especially with small pieces. Quilting for years, never tried working with wool. Time to winter with wool! I use a buttonhole stitch mostly but sometimes use a whip stitch and have been known to use both in the same project. Wool appliqué has fast become my favorite thing to do. So fun and relaxing. I use both buttonhole and whipstitch, depending on the project. I have never tried wool applique but would love to do so. The lovely colours of the wool make it very appealing. I usually use a buttonhole stitch but will have to try the whipstitch. I’ve never tried wool applique, but I’m willing to give it a try! I prefer a buttonhole stitch for most of my appliqué. On modt of my stems, I use the cross stitch. I prefer the buttonhole stitch. I had always used the blanket stitch but have made several of Bonnie’s patterns lately and tried her whipstitch technique… looks great and very easy! I use either the button hole or just a straight stitch. Depends on how small the applique piece is. I have used the buttonhole stitch for years on all my wool find it easy an love the finished look. I use a buttonhole stitch. I’ve never done wool appliqué but I’m definitely ready to give it a try!! This book looks great- very inspiring! I use a whip stitch for my wool appliqué. I’ve only done this a couple times but both times I have used a blanket stitch. I have never worked with wool but my friends do and want me to. I do know how to whip stitch and the blanket stitch . I usually use a whip stitch but occasionally use the button hole stitch: however, I have trouble getting it to look even. I use a ladder stitch on the sewing machine for appliqué. I’ve never tried tried wool appliqué, but have wanted to give it a go. Hand work is becoming more appealing to me since I’ve been doing EPP. Thanks for the opportunity to win this offer. I mostly use the whipstitch. I usually use a buttonhole stitch. I use a whipstitch just like Bonnie. nice as Bonnie does. Have not used fusible but look forward to trying it.Love the book !!! I made a couple of wool appliqué ornaments some years back, and I used a buttonhole stitch. I’d love to try again with this technique. So my answer is: I’ve barely tried wool appliqué, but I’m ready to give it a try again! I used the blanket stitch before but plan to use the whip stitch on my next project. I’ve never tried appliqué but I’m ready to give it a try. I’ve just started to applique with wool and use either the buttonhole or the whip stitch. I find the buttonhole stitch puts emphasis the edges and the whip stitch melts into the wool…depends on what kind of finish im looking for…. I use buttonhole stitch but would like to try whip stitch! Never have done wool appliqué. Would love to dive in! I’ve not done a lot of wool applique, but what I’ve done has been the same whip stitch she has shown. Thanks for a chance to win – what a fabulous prize! I prefer a buttonhole stitch, but then I’ve never used fusibles when doing wool applique. I use both whip and button hole stitches for the applique = depending on where the piece lies. Underneath, it’ll get a whip stitch, on top is the buttonhole. I use both stitches depending on the shape of the wool piece and whether or not the buttonhole stitch will show up very well. My stitch of choice is the blanket stitch if I want the stitches to show. If not, I use a stitch much as I would for needle turned applique. I’ve never used flannel but after reading Bonnie’s approach, I know i’ll be collecting some of the beautiful flannel fabrics I used to pass by. Thanks for the ideas. I use the buttonhole stitch on most wool appliqué. I use blanket stitch however if the piece is small i use the whip stitch. I’ve haven’t tried wool appliqué but these patterns look amazing now I want to try! I almost always use the button hole stitch. I have to admit, I’m just starting basic applique and I would never have thought I could do the wool until I read your post about Bonnie’s methods. Thank you for the inspiration! I’ve never tried wool appliqué but I’ve wanted to. This book looks like fun. I’ve never worked with wool, but Ikd love to try because I love doing hand work and generally use a blanket stitch to attach appliqué. I like to use a whip stitch to attach the larger pieces and then decorative embroidery stitches to enhance the design. I prefer blanket or buttonhole, depending on the wool. I use the blanket stitch. The stitch I use depends on the look I wish to achieve. I mostly use the Whipstitch, which I am currently teaching my granddaughter to do! Sometimes I use the blanket stitch, especially around outer borders. I use a whip stitch or buttonhole, depending on the project! I’m a beginner and learned wool appliqué usingthe buttonhole Stitch. The whip stitch has certainly piqued my interest Though! I use both the Whipstitch and buttonhole stitch. It depends on the shape. This book looks great and who wouldn’t want that beautiful wool!? This book & wool looks so beautiful!! I have done 2 projects in wool & love doing the blanket stitch but I want to get back to it & learn more stitches! I’m just starting to get into wool applique. I’ve been using the buttonhole stitch, but I’d now like to try Bonnie’s whip stitch. I love to do button hold stitching by hand on wool. Problem….I also do it on cotton projects!! Rarely use a sewing machine. I have not attempted a woolies project yet but I would probably use a small blanket stitch. Would love to work with this type of fabric though. I’ve only used the blanket stitch for projects I’ve done. Would love to win the package and try using the flannels for a project. Have only done appliqué using wool so far. Thanks for the opportunity to win. I am ready to try Wool Applique. I love Bonnie’s designs. Love working with wool, I do the whip stitch most of the time. I use a buttonhole stitch when adding layer on top. I am a fan of the buttonhole stitch and its fun variations. What a lovely giveaway! Bonnie is so very talented!!! I do button hole stitching by hand on wool projects. Problem…I also do it on cotton projects. Rarely use a sewing machine. I prefer the blanket stitch. I used both whip stitches and blanket stitch depending on the look I want. I usually use the whip stitch. I’m just getting into wool appliqué. Love the look of the blanket stitch. I use both stitches. I am so excited to learn about Bonnie’s Woolies Flanel. I’ll be looking for it. It’s been a long time since I’ve done any stitching but I’d love to get back to it! I have not tried wool applique, I think I would use button hole stitch as I do both depending on what is needed for that project. I’ve never tried wool applique’, but I’m ready to try it!! I have never used this product before but would would love to try this method. Also I am interested on the charm packs. I am a blanket stitch/buttonhole gal. I use blanket or whip stitch. I use a combination of the whip stitch and blanket stitch to secure my pieces depending on how prominent I want the stitching to be in the piece. The stitch I use depends on the project and the size of the piece. My usual stitch is the blanket stich but I do use the whip stitch. Wool applique gives me something to work on at night while I am just relaxing. I’ve never tried wool applique but anxious to give it a try! I’ve never done wool appliqué, but would love to try it! I usually use a whip stitch. If I’m in a hurry I’ll do machine stitch raw appliqué. I’ve never tried wool but it is soooo interesting. Thinking of a project I would like to do in wool. This give a way could get me started. I use both stitches depending on what I think looks best. I am a wool appliqué lover! I haven’t tried it yet but it’s on my list! Mainly use buttonhole, but have used whip stitch on occasion. I prefer the blanket stitch but it all depends on the project. I have never used wool in my applique, but would love to try it. I have used both whipstitch and blanket stitch depending on the type of fabric, thread and effect that I want. I love the look of the wool! I have not tried it yet, but would love to! Thank you for the great information! I’ve only done one wool appliqué project, and that was recently. I used a blanket stitch with floss. I mostly use the buttonhole stitch. I use both the whip stitch and the buttonhole stitch, depending on the project and sometimes depending on the size of the piece. I use buttonhole stitch most of the time, Whipstitch once in a great while. I prefer a buttonhole stitch. Thanks!! I’ve never done wool applique – I did some cotton applique using a whip stitch, but that was quite a few years ago. The patterns displayed are beautiful, and I would love to try Bonnie’s technique! Wow! I really like these look. I’d like to try. I prefer to use a buttonhole stitch. I use the whip stitch. I prefer that over the button hole stitch. I’ve never tried wool or flannel applique, but I have done applique with cotton. I usually use the blanket stitch on my machine for fusible applique, and a blind whip stitch for needle-turn applique by hand. I have never worked with wool. But would love to give it a try. I love.the penny rugs I see people have made. I use both a whip stitch and a buttonhole stitch. I love wool projects and cannot wait to do more of Bonnie’s patterns. I use buttonhole stitch and love wool appliqué. The best source of wool I have ever found was a lady who sold rug hooking supplies and fabric. I do a lot of wool and flannel applique. I use the blanket stitch exclusively. I like the look of the blanket stitch. It gives the edge a completed look. I use blanket stitch most of the time but occasionally use a whipstitch on small pieces. I use the blanket stitch most often, but am broadening my applique skills by trying new stitches. I LOVE using the buttonhole stitch, and I always fuse. I finished Bonnie’s Calendar of Cats in wooly flannel. What a great quilt!!! The fabric is so great to work with. I just love these squirrels!!! So cute!! I use blanket stitch – I love the effect it gives. Wool appliqué my favorite! I use a buttonhole stitch around small to medium-sized pieces and a whipstitch, straight stitch, or french knot to hold very small pieces. I ha e only used the button hole stitch. I’m fairly new to working with wool and didn’t know there was another possibility. I will be trying out the whip stitch on my next project! I only tried wool applique once and used a blanket stitch. A friend of mine recently showed me her project done with a whip stitch. I’d like to try that method! I love using the buttonhole stitch when working with wool!!! I’ve never tried wool applique,but I’m ready to give it a try! I usually use a combination: very small pieces get whip stitched and larger ones get buttonholed. I haven’t used fusible but it looks like it will simplify my work! Thanks for the instructions for this technique. Mostly I’ve used buttonhole stitch. Buttonhole stitch is the best! I prefer the buttonhole stitch! I use the buttonhole stitch on wool. I am going to try other stitches on my next project. I use the blanket stitch most frequently, but am trying to broaden my skills by using some of the other stitches. I use the blanket stitch, but see that whip stitch works, too. I haven’t tried it yet, but I want to! Love the look of blanket stitch. I prefer the look of a blanket stitch for most pieces. I really like the look of button hole stitch. But have used the whip stitch and the blanket stitch. I use mainly a whipstitch when appliquéing with wool. I find it finishes the project well especially when securing the wool first with fusible web. 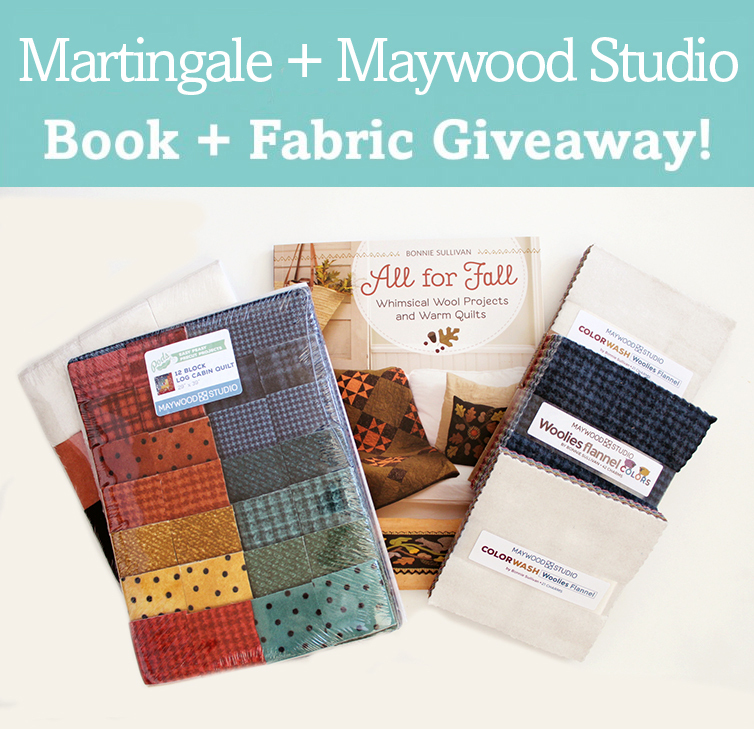 Thank you Maywood Studios and Martingale for this lovely giveaway! Depending on the project I use either. I like the whip stitch though! I’ve not tried using the fusible products with wool, great idea. I’d love to give it a try! I’ve used the blanket stitch with applique in the past. Absolutely love the Maywood fabrics! They are gorgeously yummy! I prefer the buttonhole stitch. Love how it looks. i have always used a blanket stitch but now i will try the whip stitch. i think the whip stitch may be faster. I’ve never done wool appliqué, but I wood love to give it a try..
I’ve never tried wool applique. Really need to try this flannel. Sounds so luxurious to work with. I think I would prefer the whipstitch altho I think I would try the blanket stitch and see what I think. Thanks for the fusible web and new fabrics info. Also the giveaway! I love doing wool applique. I use different stitches depending on the project, but the buttonhole is my favorite. I use blanket stitch, whip stitch, or whatever embroidery stitch fits the design. I prefer buttonhole stitch and other decorative stitches. I use the blanket stitch as it is easy to do and I like the look of it. I am just getting started with wool appliqué so everything is new for me. But I think I am gonna LOVE it! I’ve never tried wool applique but am willing to give it a try. I’ve used fusible web a number of times. I prefer buttonhole stitch, but occasionally will use whip stitch. I use whipstitch on my wool. I’ve never done wool applique but would like to try it. It took me quite a while to even try applique but I love it now! Wool appliqué seems like the perfect craft with our cold Maine winters. I use the buttonhole stitch and various decorative stitches for accents. I have never done wool appliqué only on cottons but I’m always up to learning something new as I love any kind of handwork. I prefer the blanket stitch but have not done too many projects. Love the woolies fabric! I’ve heard wool appliqué is fun after doing needle turn. I’d like to try it. I generally use a blanket stitch, but I’m going to try the whip stitch. Love doing hand work in the evenings while I watch TV with my husband. I’ve never tried will applique, but I would love to try it out! I see the blanket stitch. I like the button-hole/blanket stitch – I use it even on very small pieces. I usually use a whipstitch. I use the blanket stitch on most pieces. I have never donewool appliqué or used the fusible but I would like to try it . The projects are so beautiful! I have never tried wool appliqué but would love to try. Love the Maywood Studios line of fabric. and the fabric is beautiful, too!! I have used whip stitch, but have been learning additional stitches using Sue Spargo’s book! I use a whipstitch to sew down the wool shapes, but a blanket stitch to sew the front and backing together if it is also wool. I sometimes use homespun as a backing instead. I use a blanket stitch, even though I’m not great at it. I have always used the button hole stitch. Now I’m going to try using a Whipstitch. I mainly use the buttonhole stitch, but occasionally the whip stitch, depending on the size of the piece and if part of it is hidden. I have always used the blanket stitch. Now I’m going to try using a Whipstitch. I’ve always used the button stitch-it was the way I was taught. To learn wool applique is on my to-do-list. I load my sewing machine with pearl cotton in the top and buttonhole stitch everything. Bonnie’s designs are so cute! I prefer to use a blanket stitch, but use a whip stitch on small areas. I use the blanket stitch as I like the looks of it. Even if I’m using my machine I use blanket stitch. However, if I’m doing a small article I will use whip stitch. I mostly use the whip stitch. Love working with wool! I just finished my first wool appliqué project. It’s a table runner. I saw a picture of the table runner but didn’t have a pattern so I made up my own. I love how it turned out and I loved working with wool. I’m hooked on this process now and there are such beautiful wools out there to choose from. I’m ready to start building my wool stash! I use machine applique stitches because my hands don’t work like they use to but I love working with wool. I use the buttonhole stitch. Working with wool is so fun and relaxing. Love it! Great post and cool giveaway! Thanks. I use both whipstitch and buttonhole stitch for wool appliqué. Such a generous and delightful giveaway. Thank you so much! I have never done wool applique. But this looks like a fabulous method. Hi, I haven’t tried appliqué with wool, a little with needle and tread with cotton. I’ve seen beautiful patterns for wool, but put them back. I’m a quilter, but use to do cross stitch and needle work. Then I caught the quilting bug, but after 20 some yrs, I miss the calming effect needlework does for me. I would love to win this ! Oops. I forgot to answer the question in my first post. I have not done wool Applique but I’m thinking I’d probably use a whip stitch. By the way, those wool packs are beautiful. I’ve only done a tiny bit of wool applique and was taught to use the blanket stitch. I like the look of the whip stitch. I have never tried wool applique, but with some good instruction I’d give it a try. I have always wanted to learn to wool applique and I think I would use both whip stitch and blanket stitch. I am trying to learn, perhaps this book is the answer. Can’t wait to see it. I use both the whipstitch and the buttonhole stitch. I love wool applique! I used both the buttonhole stitch and the whip stitch and sometimes use a French knot when attaching "berries" and other small circles. 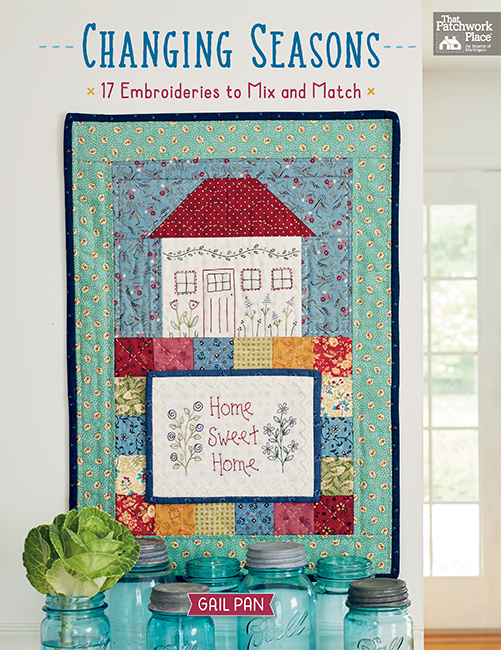 This book looks fabulous – I love to sit and sew on my wool applique’s while watching T.V. and when traveling. Thanks for the short tutorial on using the fusable – I have a problem with it not fusing well guess I need to increase my time and iron from the back as well. I’m a buttonhole stitch gal. Love the giveaway. I use the blanket stitch most of the time. Thanks for a great giveaway! I use buttonhole stitch but whip stitch looks like it would be faster so maybe I’ll try it. I have used both stitches, it depends on the effect I want. I’ve never tried wool appliqué, but I’m ready to give it a try! Love the look of it! I prefer to use the buttonhole stitch. I use both the whip stitch and the blanket stitch on my wool applique. It depends on the project. I have occasionally used other decorative stitches as well. I have not done a lot wool appliqué , but what I have done has always been the Blanket stitch. I would like to learn how to whip stitch andI would love to try the Maywood Studio flannel!! I particularly love doing handwork. I use both whipstitch and buttonhole stitch for my projects. I’m a button-hole girl all the way! I have not been sewing long, I have appliqued but I have not yet used wool for any kind of sewing. I would love to learn the techniques. I like buttonhole stitch best. I use whip stitch sometimes but I feel my work looks better with buttonhole. What fusible does Bonnie use? I’ve tried that method and I find it really difficult to stitch through. I gave up on that because my fingers got so sore. I have been using a buttonhole stitch with pearl cotton thread, but I think that I will have to try Bonnie’s method using the whip stitch. Thanks for another wonderful give away. I use the whip stitch just like Bonnie. I love wool applique. I use the blanket stitch. I use the buttonhole stitch! I would use the blind stitch. It’s easy by hand or machine. I love these woolly flannels, so soft feeling. Thanks for the giveaway. I haven’t tried wool applique, but I have some basic supplies and I am ready and willing to try it! I use a buttonhole stitch, it is my go to stitch for fusible applique. I have only done. A few appliqué projects and never wool but would really LOVE to win this beautiful collection and book and get started on a wool project. I really like the illustrations you are showing! I use both a whipstitch and a buttonhole stitch. It just depends on the look I want. I often use buttonhole stitch, and sometimes actually use my sewing machine with a heavier weight thread. I have never tried wool applique but have always wanted to try it. I think the method I would use would depend on the size and shape of the pieces. I could see me using both techniques. I have not tried wool applique yet, but have been making wool purchases. I have been thinking about getting Bonnie’s flannels, such beautiful colors. Thanks for the opportunity to win some! I use the buttonhole stitch. I enjoy working with wool n I generally use a button stitch. I prefer using the blanket stitch but I may try Bonnie’s method. I mostly use whip stitch in one strand of silk floss in a matching color. It makes it nearly invisible. I use a whipstitch and fusible web. I guess you can call what I do a whip stitch. I am a little funky with my stitching. Never attempted wool applique; this fusible method seems doable so likely to try it in my first wool project this winter. Thanks for the insight and tips! I use both, depends on the look I want. I use a blanket stitch with Valdani 12 wt perle cotton. Thanks for this chance to win your great giveaway !!! I have used both whip stitch and blanket stitch. I have never done any wool applique. When I see work other have done I love what I see. I would like to have a chance to expand my quilting knowledge. I have never tried wool applique and would like to try it. I use a buttonwhole stitch. And I have to relearn Everytime! I will substitute different stitches as I think they might look nicer. Think the whip stitch just might be a good/better way to go. 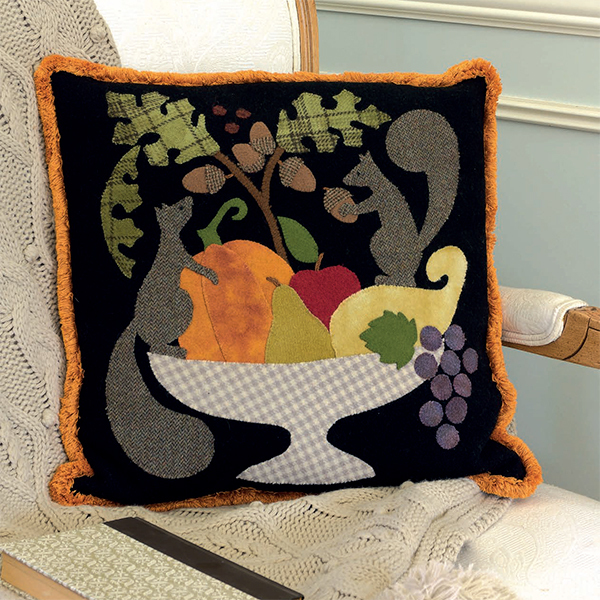 I love the squirrel pattern….so adorable. I think the type of stitching I would use, since I am a beginner, would depend more on the design. I use the buttonhole stitch and perle cottons. I use both stitches – whip stitch in tight places and buttonhole for show. I love working with wool. If I’m decorative stitching I use matching wool thread and whip stitch. Or I’ll use pearl cotton and buttonhole stitch with a contrasting color. Love these patters! I am just getting into wool applique and this book would be very helpfull. Bonnie’s work is just beautiful. I usually use a buttonhole stitch. I will try the fusible again – didn’t have a great time the first time I used it. The tip to press from the back may do the trick for me. I also use a whipstitch and many times I will also add a buttonhole stitch or some other embroidery stitch for embellishment. I love working with wool! I am a novice at wool appliqué so I’m willing to try something different. Currently I use the buttonhole stitch. It’s very relaxing to sit in front of the fire with a wool project. Pretty quickly done and very satisfying. I use the buttonhole stitch exclusively, but many different types and sizes of threads. I use fusible web and the applique stitch on my machine. I like the primitive look of a buttonhole stitch for some projects, but my whip stitching is much faster! I’m with Terri – the stitch depends on the project and how much I want the thread to show – or not show. Love Bonnie’s patterns and fabrics. Both . . . but whipstitch the most! I haven’t done wool applique, but I suspect I would use the whip stitch, since I’m most familiar with that for other uses. Beautiful projects, and gorgeous fabric – will have to see if my quilt shop carries it, if I don’t win. I’ve never done wool applique but I really want to try it! I use a whip stitch but I would be willing to try anything new. I’ve never tried wool appliqué but am ready to give it a try! I use a buttonhole stitch when I applique. It’s just the look at I prefer. Such a lovely bundle of goodies! I have never worked with wool, but would love to try it. I use a buttonhole stitch when embroidering by hand. I have never tried wool applique but I’m ready to give it a try. I use buttonhole most of the time, sometimes whipstitch depending on the piece. I only use fusible. I like to use a buttonhole stitch. I’ve never tried wool appliqué, but I’d like to. I usually use a blanket stitch but sometimes depending on the piece I will use a whip stitch. I have not done a lot of wool appliqué but love the look and plan to do more of it! I love wool appliqué! I primarily use the buttonhole or blanket stitch with Valdani Perle cotton, and a whip stitch on the teeny tiny pieces. I’ve never used wool for applique, I’d love to try it. It depends on the project. Many times I will use a blanket stitch in a contrasting color thread. I just started to learn about wool working. The easy way for me has been the button stitch. Just love it. I like to use Whipstitch on most appliqué work, wool, woolly flannel or quilting fabrics. Great giveaway! I have never tried wool applique, but after seeing all the beautiful items you have shown, I would love to try making something. The quilt shown is gorgeous! I prefer a buttonhole stitch for wool applique, though I do sometimes use a whip stitch. I haven’t done any wool applique but would like to give it a try. I’ve never done wool applique, but I am very anxious to try! I use a blanket stitch to secure the applique. I love to use a buttonhole stitch on wool appliqué, but I might incorporate that whip stitch for some of the elements to add a different look. I’ll be on the lookout for some Woolie Flannels! I have only done wool appliqué one time. I used a blanket stitch. After seeing the Whipstitch I can’t wait to give it a try. I prefer a buttonhole stitch on most projects! I did a wool appliqué BOM once and used the blanket stitch on my machine. I use whipstitch and make embellishment stitches over the top. I never have tried applique with wool but I think I would prefer to use a buttonhole stitch. I’ve never tried wool applique, but look forward to starting. I haven’t used either one because I’ve never had wool to appliqué with. I’ve always admired Bonnie’s work, but just can’t afford the fabric. So, I would love to have the opportunity to work with her wool and make both the whip stitch and button hole stitch. It would be a dream come true. I use both blanket stitch the most but sometimes whiostitch works better. I have never tried wool applique but it has always intrigued me. I haven’t tried Wool.It is a great expense for me. I’m an avid cross stitcher & dabble a little in sewing (both machine & hand). Would like to give it a try though, given the opportunity! I have not done one yet, but would love to try. I love the blanket stitch for a traditional look…..but it is just such fun trying new ways and stitches. I like the look of the buttonhole stitch so I’ve done most of my wool appliqués with it. Yet in certain instances, when the pieces are small, I do a whip stitch. I have always used a whip stitch, just like Bonnie. Recently I have tried a blanket stitch around larger pieces, and I really like that look. I don’t like wool even though I know it’s the fad right now. I’ll stick with flannel. I like to use a blanket stitch for wool applique. I am just trying wool appliqué. My first block I /have used chain stitch. The hardest thing is to find a source for wool. I haven’t tried wool appliqué yet, but I plan to. Bonnie’s method seems doable to me. I’ve never tried wool appliqué, but after seeing all these beautiful creations, I think I’ll have to! I have never done any wool applique, but have been looking forward to trying it. I know the buttonhole stitch, but I am always willing to try new things. Thank you for the tutorial on using fusible web. I will definitely give this a try. Happy Fall! I haven’t tried wool Applique yet, but I’d like to try. Beautiful samples on your blog! I use a blanket stitch unless the pattern calls for a different stitch. I have only made a few projects with wool applique and used the buttonhole stitch. I would love to try the whipstitch, just like Bonnie. I Haven’t done wool applique but in other types of applique I use the blanket stitch. I’ve always used a buttonhole stitch. I’d like to try the whip stitch like Bonnie just to see what I think. I use blanket stitch! I just love wool and flannels…. I prefer a buttonhole stitch…it just seems to lend itself to the folk art look that wool has (and flannel too). A whipstitch is tricky for me, but of course Bonnie’s look great. Love her patterns! I like the blanket stitch best, but there are certain pieces that (IMO) require a whip stitch. Consequently my blanket stitch is better looking than my whip. I have never tried wool applique but I use the buttonhole stitch on cotton. I have never tried wool applique but I know it’s next on my list of things to try! I use the whip stitch also. Love wool applique but also love flannels! Whether I am sewing with cottons, flannels, or wools, buttonhole is the way to go! I usually use blanket stitch, but I love seeing what Bonnie recommends, and definitely want to try her approach! I have never done wool applique, but it is appealing to me to try. I use the buttonhole stitch when I do wool. Have been doing wool for many years. One of my favorite things to stitch. I have not done wool Applique before, but I am seeing projects that I find beautiful and will be trying my hand at Wool Applique,.would love to win this giveaway, thank you for the chance to win. I’m a fan of the look of the buttonhole stitch, but I can see how the whip stitch would do the trick with wool. I use a buttonhole stitch, but will try the whip stitch as it looks a little less time consuming. I use a blanket stitch, and love to work with both flannel and wool. I just can’t decide which I like best. Thanks for the chance to win! I am new to wool Applique! I really like the blanket stitch but can see whip stitch would be appropriate for some designs too. I like Perle cotton for blanket stitch! I have never done Wool Applique, but I see so much that is beautiful. so I will be trying my hand at it. would love to win your giveaway. Thank you for the chance to win. I’ve never tried wool appliqués but I am ready to try. I’ve never worked with wool but would love to try it! I’ve never tried applique with wool, but I’d like to try! I like the buttonhole stitch, using 2 or 3 strands of embroidery thread, sometimes contrasting colors, sometimes matching. I have also done some machine applique with flannel, using a buttonhole St. then too. I’ve never tried wool appliqués but I am ready to try and Bonnie’s new book looks like the perfect place to start. I’ve been wool applique for about a year. I use the stitch the pattern or instructions use. Its fun. Thank you . I haven’t done much wool applique, but I love the look of buttonhole stitch. I use both whip and buttonhole, depends on the project. Love Maywood flannel.I use fisible; so much easier. I have always used the blanket, I had not heard it called the button stitch before, but I am going to give the whip stitch a try. I need some hand projects to do while my husband is going through chemo. I am encouraged to try the new method. I do most of my applique by machine, however when I do it by hand I use the buttonhole stitch. I use blanket stitch primarily ❤️ Generous giveaway! I like using a buttonhole stitch. Love, love , love Bonnie’s flannels! I prefer using a blanket stitch. On occasions I’ve used the whip stitch. Thanks for giving me a chance of winning this wonderful gift. It would be many hours of pure joy working on these projects. I do both stitches. I also do fusible; so much easier. I have done a little wool applique and usually use a buttonhole stitch unless it is a very tiny piece, then whipstitch. Those flannels look scrumptious, thanks for the opportunity to win! I like to use a whip stitch just like Bonnie. I like to use silk thread too. The stitches just melt into the wool and can not be seen. I use the blanket stitch mostly but I’m starting to use a whipstitch. I have never tried wool applique, but I will try to do it. I truly love wool applique! I have used both whip stitch & blanket stitch – and then get carried away sometimes as I start embellishing each piece of wool with stitches & beads etc., etc. And I do love Bonnie’s designs especially the whimsical ones. I’ve not tried working with wool yet, though it’s on my "to do" list! Mostly the examples I’ve seen have been blanket stitch. I like to use the buttonhole stitch but I might try whip stitch when I try the fusible. Wool Applique is my passion! I just finished a Christmas tree skirt using button hole stitch but I often embellish with many other stitches! Did my first wool class and project recently–really liked it. I want to do more, and am now on my second project. I love the blanket stitch. It adds an extra special touch. I want to try wool applique. I enjoy hand applique. Wool Applique is fun take along project. Usually use a blanket stitch, but have use regular Applique techniques. I use the buttonhole stitch but I am new to this so may try whip stitch next time. Love the book! I’ve never tried wool applique, but love the rich look. I’m ready to give it a try. I have experimented with small size wool applique & used whip stitch for most, but tried the fine blanket stitch on larger pieces and happy with that. Working with wool is so comforting to me. This book & offer would be exciting to receive. Thank you. I haven’t tried wool Applique yet but would love to try. I use the whipstitch, just like Bonnie. I would like to try both the whipstitch and the buttonhole stitch. I have quilted since I was 11 years old. I have never worked with flannel or wool. Would love to have the chance to do so. Her patterns and work are beautiful. I like to use buttonhole stitch for my wool applique. I love Wool Appliqué! With flannel it would be even easier. I use both stitches, depending on what I am working on. I use whip stitch in most cases, but blanket stitch for penny rugs. Have only done one project in wool. For that one I used buttonhol stitch. I haven’t done much wool applique, but have purchased a few kits. So far I have only tried the whipped stitch. I really enjoy the beauty and warmth of wool applique designs. I use buttonhole stitch as well as whip stitch. I also love to use decorative embroidery stitches to appliqué. I prefer to use a buttonhole stitch; however, there are times a whipped stitch works better. I use buttonhole stitch and sometimes whip stitch on wool applique. I use either a buttonhole or whipstitch depending on what I’m working on. I’ve never appliqued with wool but love the look of it and am anxious to try it! I love wool Applique, but haven’t actually done much of it. On what I have finished, I’ve used a blanket stitch (aka buttonhole stitch). I’ve only done one little project with wool (loved it! ), but wish I had known about the fusible then! Love the pictures in the book! I use a whipstitch, it’s so much fun to do! Buttonhole stitch! Love the fabrics and beautiful projects! Thanks for the giveaway! I have not done wool applique but would love to try! I love the look of blanket stitch on wool. Can’t wait to try the fusible with wool. Very inspired. I have never done this, but would love to give it a try. I use the blanket stitch most of the time but I do use the whip stitch on more primitive pieces. Love the book All for Fall! I have not done any wool applique. I have a kit waiting to be started and I will now try the tips from Bonnie. I usually use a buttonhole stitch…sometimes by hand and sometimes by machine. So many pretties to make!! I use both stitches depending on the look I want and how quick I want to finish! !Love the giveaways! I have never tried wool applique before, only cotton, but I am willing to try. I prefer to use the blanket stitch on my wool appliqué. I enjoy your books and your clear way of discribing the stitches you use. I prefer a buttonhole stitch when appliquing wool projects. I prefer using a buttonhole stitch but have used other stitches as well. I use the blanket stitch and the buttonhole stitch. I love both stitches for wool.You can make it hidden or stand out. I prefer using a buttonhole stitch when appliquing wool projects. I’ve never tried wool applique (it looked hard), but with the directions I just read, I would love to give it a try. The results look beautiful! I have never tried wool applique but I would so much like to try it. Your guide makes it look easy. I use both the whip stitch and the buttonhole stitch. Never tried wool applique, but there’s always a first time. I love wool applique, I use both blanket and whip stitches. I have used the buttonhole stitch but am ready to try the whipstitch. Bonnie’s designs and fabrics are beautiful. Thanks for sharing her tip. I’ve only used the blanket stitch and will have to give the whip stitch a try! Thanks for a chance to win a great giveaway. I have never tried applique with wool, but I am willing to try. I have not tried it either, but I would like to! I’ve never tried wool applique but I would sure give it a try with this great prize. I have never done wool applique but it looks fantastic & i would love to give it a go. thanks for the chance to win. I’ve never tried wool applique but it looks good, so I’d like to try it. I like the buttonhole stitch. I haven’t tried wool applique – but would probably use a blanket stitch. Would like to try someday. I’ve never tried wool appliqué, but I’m ready to give it a try! And this would be a beautiful project to try. 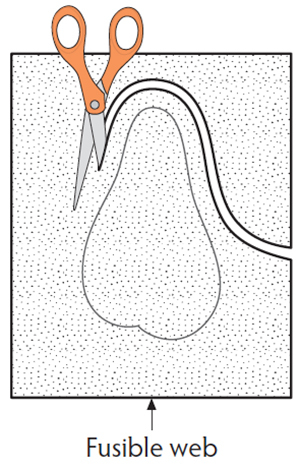 Generally use a blanket stitch-others when appropriate. Great book and fabric! I prefer a blanket stitch, but I do use a whip stitch sometimes. Mostly the buttonhole stitch but on tiny pieces the blanket stitch. Oh gosh I’d love to try wool appliqué! The book looks intriguing. I use blanket stitch with Madeira Lana thread or old Ginnie Thompson flower thread. I like to use the blanket stitch, but I also like to use other stitches for detail and texture. Love wool applique and use the blanket stitch! A whipstitch usually does the trick for me! I use a whip stitch, just like Bonnie. I also like the blanket stitch! I use a blanket stitch when doing wool applique. I use a blanket stitch for wool applique. Wool is one medium I have not yet worked with, but still on my list of things to try! I have used both the whip stitch and blanket stitch, and like them both! Blanket stitch but as a beginner have stuck to this basic one that I know. Love using the whip stitch on wool!! I’ve done a small amount of wool applique and used a buttonhole stitch. Am anxious to do more. I have never tried wool applique. I have a few patterns and have used cotton material and appliqued with that instead. Looks like a great book and materials. 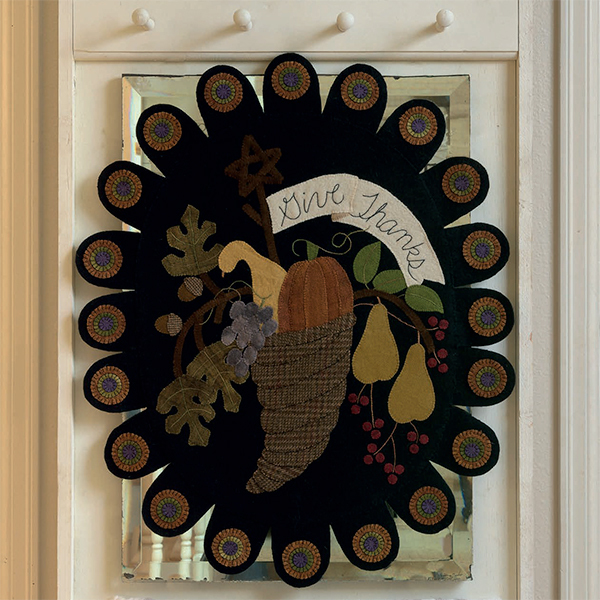 I have never done any wool appliqué but would love to try it – fall is my favourite season, I love the colours. I haven’t done much, but I love the look of the blanket/buttonhole stitch with wool felt. It’s such a vintage/primitive look. I have done some whip-stitching as well but mine tends to gets wonky and inconsistent (aka need more practice). I would love to try more and I love the previews I have seen from Bonnie’s All For Fall book! Never thought to use fuse able web for wool. Should make the button hole stitch so much easier, no pins to poke you. Blanket stitch is my go-to on wool appliqué. I have not tried well applique yet but intended to. I have never tried wool applique but it looks interesting. I would like to give it a try. I love the blanket stitch! I’m always ready to learn a new method though. I have never tried wool appliqué. I’d love to learn how to do it. I have always used the button hole stitch but I am looking forward to trying the whip stitch. I love working with wool. It is soft and so forgiving. It feels great on my hands. I like the blanket stitch, however I do like using the whip stitch , depending on the piece I’m working on. I made some wool applique mitten ornaments last winter-enjoyed it thoroughly. I love those mats-the squirrels are enough to make a person squeal with delight! I used buttonhole stitch on the larger pieces but a whip stitch on the smaller pieces. I haven’t seen the Woolie flannel in my local stores yet but maybe because I didn’t know about them. I’ll have to look or ask next visit there. I love doing wool applique! I am fairly new to this form of applique but have done several pieces. I enjoy using the blanket stitch but would like to start trying other stitches and using embellishments like beads, etc. Just started playing around with wool applique and love it. I use a blanket stitch but like Bonnie figured out, I need to find what I’m comfortable with so may try a whip stitch on my next project. I like the buttonhole stitch best but I am trying to use the whip stitch more often! Blanket stitch works best for me. Hi, I’ve never tried wool appliqué, but I’m ready to give it a try! I’ve done applique with cotton fabric a few times and used a blanket stitch. Thanks for all the information and the giveaway! I’ve never tried wool appliqué but would like to give it a try. Never tried wool. Looks easy enough, think I would like to try. I enjoy applique and use a stitch that seems right for the block. I prefer the buttonhole stitch because I find it so relaxing to work. I have used the whip stitch but often find finishing the applique just goes too quickly using this stitch. I like to savour my moments with wool applique. I always use a blanket stitch. It looks so nice. I do appliqué cottons and I use a blanket stitch for that. I haven’t tried wool appliqué yet but I am ready to try it. This prize would give me a push into trying it. Here’s hoping I win! I’ve never tried wool applique, but I’m ready to give it a try! Yep, that’s me, and this all looks beautiful! I usually use the buttonhole stitch. I love applique and do a lot when I’m quilting but I’ve never tried wool applique. It’s something I’d love to do. I’ve never tried wool appliqué, but I’m ready to give it a try! I love the look of the vibrant colors on the black background. Wool gives such depth to the colors. I have used the blanket stitch but may have to try the whip stitch on my next project! I usually use blanket stitch. Woolies are my absolute, hands down fav fabric of all time. I love wool appliqué! I would jump in to start a wool project. I have used blanket stitch so far but would like to try whipstitch next time. I do like the look of needle turn and with these type flannels, it is doable. What a beautiful bundle! I usually use a blanket stitch, but it depends on the piece and the look I want to achieve. I also like to use some decorative stitches just to mix it up. Wool applique is so relaxing and makes me happy! i love wool work but have only used buttonhole stitch before. I would like to try Bonnie’s whip stitch next time. I have never tried sewing with wool before, but I really want to try. When I have the chance to, I want to learn the blanket stitch. It always looks so pretty, it adds detail to the designs. I’ve always used the blanket stitch, but I’m going to try whip stitch on my next project. I have used both! Would love to win this fabric! I like to use lots of different stitches in different situations. I have never tried wool applique but would like to try it. Shiny Happy World says to use wool felt, not the cheap stuff you can buy anywhere. I stick to the Blanket stitch for my wool projects. Wool is the greatest fabric to work with ……I am still in awe of all the colors and patterns in wool now. Simply better than all else to me. Thank you for this awesome opportunity. Thank you, thank you…. I’ve used mainly blanket stitch and appliqué for cotton fabrics but I’ve never tried wool appliqué, but I’m ready to learn and give it a try! I use a blanket stitch when doing appliqué. I am pretty new at this but I think I would prefer the whip stitch. Everything you publish is beautiful. I prefer the Blanket stitch ! I just prefer wool wool wool . I qant to say thank you for this opportunity. I can’t say enough positive words for using wool. I fell in love with wool and its never gotten old or boring. Simply amazing every time I use wool. Thanks again and God bless you. I usually use the buttonhole stitch, but have used other stiches as well. I use blanket stitch most but sometimes the tack stitch. Depends on how I want it to look! 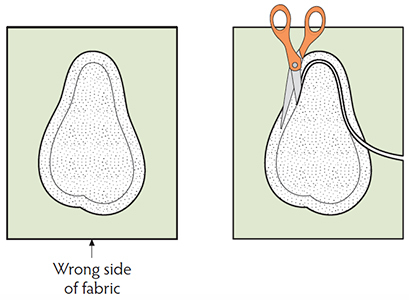 I usually use the buttonhole stitch…but ship stitching looks like something to try! I use both buttonhole & whip stitch. It depends on the project. I love using the blanket stitch!! I prefer the look of the blanket stitch, but do like to try new stitches! I’ve never tried appliqué but would love to with these beautiful fabrics and book! I always use the buttonhole stitch,but seeing the whip stitch today makes me want to try that one too. I have always used the buttonhole stitch but will try the whip stitch next time. I’ve never tried wool appliqué but for other fabrics I love the look and ease of blanket stitching. I love working with wool and I use the blanket stitch like my Grandmother taught me! Thanks for the drawing!! I have never tried wool applique but I love how it looks and would love to try it! I usually use the blanket stitch. I’m still learning. Thanks for the opportunity! Love using Blanket Stitch. But it’s all beautiful! I’ve never done wool appliqué but I’m ready to give it a try! I use a blanket stitch. I have used the buttonhole stitch in the past as I liked the looks of it, but am always open to try something new or different. I use the blanket stitch…love wool applique….just don’t see a lot of it in Texas!!! I’ve never tried wool appliqué, but I’m ready to give it a try. Wool is everywhere and it scares me, but your method makes it look sooo easy! I usually use the blanket stitch. I have not tried wool Applique but would love to try. I’m finding it very hard to find wool for Applique so this package would be wonderful. I have used whip stitch but I prefer blanket stitch. I have not done wool appliqué but would love to try it. I’m having a hard time find wool for appliqué, so this package would be wonderful. I use a buttonhole stitch when working with wool applique. Love the effect. So tidy and even. I love the country feel of the blanket stitch for appliqué. I haven’t tried woolapplique yet, but I would sure love too! It sounds fabulous, but so far I have not tried wool appliqué. Thanks so much! i use both buttonhole and whipstitch. Love the woolies! I’m a buttonhole stitch gal when it comes to folk art style applique. Up until now I’ve always done it with my sewing machine using cotton fabrics. What a fun approach to use wool and do some handwork this winter. I’d love to give it a try! I use either s whipstich or buttonhole. This book looks amazing. Thanks for the chance to win. I use a whip stitch, just like Bonnie. Cause that’s where I learned it!!! I love her patterns. and wool. and flannel. All of it! Would love to win, thanks for the opportunity! I like the blanket stitch! Love quilting wool applique and most often I use the blanket stitch. If the applique is small I might use the whip stitch. I usually use a buttonhole stitch on my wool applique, but want to try a whip stitch next time. I think it allows the wool to take center stage and not be overpowered by thread. I’ve never tried wool applique, but am ready to give it a try. I use a blanket stitch on wool appliqué. I prefer the buttonhole stitch whenever I applique. I use a blanket stitch! I have never tried wool applique but I have been checking out lots of wool projects and websites for information and ideas. I really want to get started on something! I prefer the Buttonhole stitch on Wool projects. I mainly do small projects like mug mats, etc. and would welcome the challenge of larger projects. I really like the projects in this book and the kits are great as well. Here’s keeping my fingers crossed and hope I win. Haven’t tried it yet, but would love to! I use a whip stitch. I have only done a couple of wool projects, small ones, and I used a buttonhole stitch. Both, depends on the look I want for a particular piece. I use both stitches mentioned. Buttonhole and ship stitch. Different designs call for different stitches. I have loved buttonhole/blanket stitch since I was a very young beginning embroiderer. So, of course, I use buttonhole stitch for wool applique. I usually use a blanket stitch but hope to try Bonnie’s way using a whip stitch. Awesome giveaway! I have used the blanket stitch so far but am ready to try the whipstitch for another look! I usually use a buttonhole stitch-but could be a convert! I use a whip stitch or a buttonhole stitch depending on the applique. I mainly use the blanket stitch for wool applique, but I use other stitches to embellish my wool pieces. Wool applique is so relaxing to me. Love it! I have used the blanket stitch, but I would like to try the whip stitch Bonnie uses. I use the whip or tacking stitch most of the time. Depending on the design I sometimes use the buttonhole stitch. I’ve never tried wool applique, but I love how it looks. It’s definitely on my to do list! I use a whipstitch like Bonnie. I would love to have her book. Never tried it but willing to learn! The colors in the kit are awesome? I use a whipstitch just like Bonnie! I love quilting wool appliques and prefer using the blanket stitch for most pieces except when they are very small I’ll use the whip stitch. I use a blanket stitch most of the time but use whip stitches for smaller items like berries. I use blanket stitch. Thanks! Love the richness of these projects! I use a blanket stitch as it gives a finished look to the edges. this is an awesome looking lot of wool, kits and the projects in this book would be fun to make and to enjoy in the home setting. Hope I am the lucky person to win this draw. Here’s hoping! Since I feel that I do a better buttonhole stitch than whip stitch, I use that stitch more often. I feel the project dictates the finish. Thanks for a chance at the giveaway. I haven’t tried wool appliqué yet though I do have a small one tub of wool pieces and a couple books and patterns. I like the look of the buttonhole stitch. I think it’s time I started, don’t you? I like using the blanket stitch as I like the looks of the finished edges of my projects. 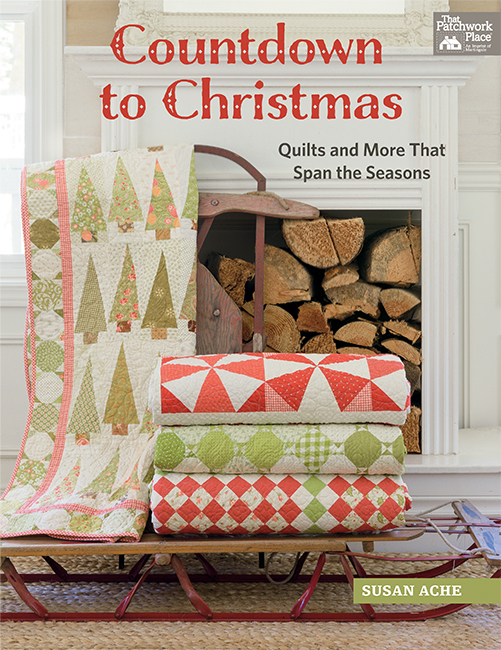 This is a great assortment of prizes and as I quilt I am interested in the kits as well as the wonderful patterns in the book. Lots of different projects to make in 2019 and to proudly display throughout your home. Hope I win! I love wool applique and do use fusible web! I usually use the buttonhole stitch but I think I will try whip stitch too now. I use whipstitch, just like Bonnie. Tigertape on my finger helps me keep it consistent. I use blanket stitch or whip stitch depending on the appliqué. I really want to try wool applique now that I have studied your guide. You make it look so doable. I have never tried wool appliqué, but I’m ready to give it a try. This would be a dream come true! I always use a buttonhole stitch but Ithink I should try some other stitches. Love, love, love the woolies flannel!! It feels so good. I am fairly new to wool applique, but I do like the whipstitch like Bonnie…can’t wait to try more…. I love traditional blanket stitch. Sometimes I use black floss to make the stitches stand out, sometimes I match the floss to the applique and the stitches almost disappear. I always use buttonhole stitch because I love the decorative outline it gives but will have to try the whip stitch soon. Wonderful prize package of gorgeous fabric and beautiful book-Thanks for the chance to win! I have never tried wool applique, but I would love to try it. Thanks for the fantastic giveaway! I’ve never done wool Applique! But I love the dancing squirrel table topper, and would love to give that a try! I use both the whip and buttonhole stitch depending on what I’m stitching. I prefer a blanket stitch…I’ve never tried anything else. I’ve done one pillow project and used a running stitch. Would love to try more!! I like the blanket stitch on larger pieces for a more finished look and the whipstitch on smaller pieces. I’ve never tried wool applique, but I’d like to give it a try! I have never tried wool applique. Always ready to try something new. I have never tried wool appliqué but it looks so lovely that I would like to give it a try. I think I like the blanket stitch. I love to use the blanket stitch for wool projects. I am inspired with all the decorative stitches I’ve seen lately. Anxious to try them on some of Bonnie’s projects. I have not done appliqué with wool; would like to!! I am planning on learning!!! I regularly use the buttonhole stitch. Then I like to embellish with decorative stitches and beads. Great idea to fuse the designs! I could lay out the entire design, fuse it into place and hand stitch (usually button hole stitch) while comfortably sitting while watching a DVD or TV show! I use a blanket stitch, but plan to try the whip stitch. It looks great. I like the whip stitch. I use a whipstitch with occasional blanket stitch accents. Thanks for the giveaway! I’ve never tried wool appliqué. Love everything about "All for Fall" I use a whip stitch. I love appliquing with woolies flannel also!!! I use both stitches depending on the look I am trying to acheive. Why limit yourself? I love them both. And I use fusible web on wool applique as well. Love it! I’ve never tried wool appliqué, but think I would use the buttonhole stitch. I love doing wool applique, and ‘ve always used a buttonhole stitch for it. Whip stitch for sure. Love the patterns on this new book! I use the blanket stitch on most of my wool projects. Lovely book and wool. Pick me! I’ve never tried wool applique, but I’d like to give itt a try! I am most comfortable doing the blanket stitch. I like to do the blanket stitch. Thank you for the giveaway! Never tried wool applique but would love to! I like using the blanket stitch. I mostly use the buttonhole stitch. Working with wool is very satisfying. I use a whip stitch and buttonhole! Thanks for the chance to win! I use a blanket stitch. But I may give the whip stitch a try soon especially if I win these goodies! I use a satin stitch for Appliqué. I’ve never tried wool applique but am willing to give it a try! I usually use the blanket stitch when appliqueing, but think I will try the whipstitch if I, by some miracle, win. Projects from the book look lovely! I like the blanket stitch. I use a buttonhole stitch. 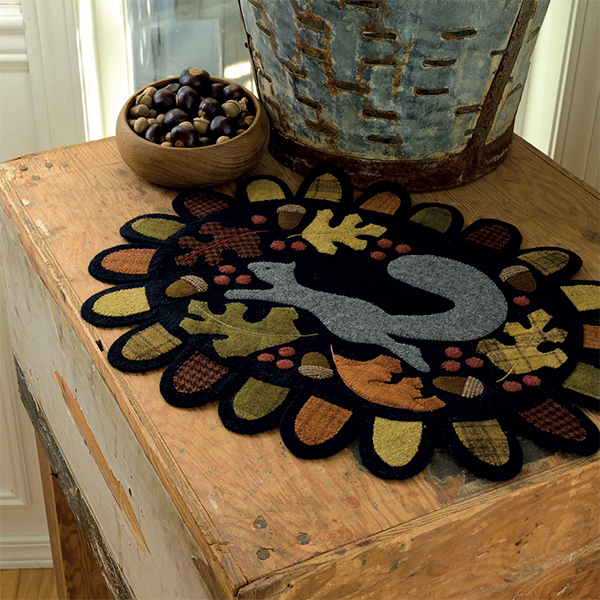 The squirrel is gorgeous, and looks really good when wool fabric is used. I think buttonhole stitch looks the best but I’ve never done applique with wool yet. I mainly use the buttonhole stitch but enjoy adding other embroidery stitches for added charm. I use both whipstitch and blanket stitch depending on what I want it to look like. I am also learning some decorative stitches. Never have done wool appliqué, but have done Hawaiian quilting. I’d love to blanket stitch with wool. I love the look and feel of wool appliqué. Love, love, love doing wool projects. The buttonhole stitch is my stitch of choice. I have never tried wool applique, but have always wanted to try it. Love the soft colors and the beautiful designs. I use a whipstitch and blanket stitch when I applique. Love, love, love wool appliqué. I use the buttonhole stitch, along with various embroidery stitches. Love the texture wool provides to appliqué. I have never tried wool appliqué. It looks so lovely that I would like to give it a try. I think I would like to use the blanket stitch. I’ve never tried wool appliqué but I’m ready to give it a try. Thanks for the chance to win this awesome prize bundle. I generally use blanket stitch but think I will try whip stitch soon. I have used whipstitch when appliqueing cotton. Would love the opportunity to try wool applique! It depends on the project but I mostly use a buttonhole stitch on wool projects. I’ve never done it, but want to try! Love working with wool❤️ I’ve always used blanket stitch. I’ve never tried wool appliqué but I’m ready to give it a try! It just depends on my project, but I tend to blanket stitch more. Thanks for the chance to win. I use a whip stitch or a blanket stitch depending on the project . I use both stitches, but I tend to use the blanket stitch more. Thanks for the give away. I use a whipstitch for my wool applique – then I embellish my wool projects with embroidery stitches. Mostly blanket stitch as I think that looks nice. Thank you for the giveaway. I usually blanket stitch with wool appliqué but will give the whip stitch a try next time! I have only ever done blanket stitch but think I may give whip stitch a whirl on my next piece having looked at he guide. I use the whipstitch. Am working on a small wool applique project now. Love it! I love wool stitching. I mainly use a blanket stitch but enjoy using many embroidery stitches. Recently tried using a fusible–now my method of choice. I enjoy adding embellishments such as small glass beads. Just a hint of sparkle ! I have never done this but would love to try. Thanks for the chance to win! I mostly use buttonhole stitch. Cute, cute projects! Pretty flannels, too. I love the look of Wool Appliqué but haven’t yet tried it! Since I love hand work and Appliqué and embroidery I really need to try it! I would love to try appliqué with wool! The tutorial really helps to explain the technique well. I like using the buttonhole stitch, it looks like a nice clean finish for my projects. Mainly use buttonhole stitch because my whip stitch is NOT even. I use the blanket stitch. This fabric is beautiful! I started a wool applique project, but haven’t finished it because I got frustrated that my pieces did not adhere well enough for me to stitch around. I’m going to try Bonnie’s method. I love the way her projects look and really want to be able to make some of them successfully. I’d like to use the blanket stitch on some and the whip stitch on others depending on the project. Thank you for this opportunity and the great tutorial. I use a whip stitch, just like Bonnie. I have all of her books. She is amazing! •I use a blanket stitch, but need to try the whipstitch. I’ve tried fusing wool without much success so I need to get Bonnie’s book and try it again! Thanks for the chance to win a copy! I prefer using a blanket or buttonhole stitch. I love ❤️ thewool applique with the blanket stitch. It looks good and is so very relaxing. I have yet to do wool appliqué. This is so lovely and just did a quilt top using 10 inch woolie squares. So cozy! I usually use the buttonhole stitch when working with wool. I would love to own a Bonnie Sullivan book! Whip Whip Whipstitch is what I use! Awesome give a way! I have used machine applique stitch on wool projects!! I have never tried wool appliqué, but i’m Ready to give it a try! I find that I use the blankstitch most often. I’ve never tried it. I’ve bought several kits though and now I’m ready to take the plunge and give it a go! I just made my first wool blanket. I love it! I saved all of the scraps in anticipation of applique. Thanks for all of your information. I just started my first wool project! Not sure at this point what stitch I will like best, but do want to try different ones. I have used the buttonhole stitch in the past. I use Buttonhole — love the look! Appliqué. I use the buttonhole stitch! Appliqué. I use the buttonhole stitch! I have never used any other stitch ! I have never tried it but would love to try! Mostly buttonhole, usually by machine! I Applique with a buttonhole stitch. I have not worked with wool yet but have started a small wool stash! I prefer the blanket stitch, but am always open to new ideas. I use a tiny invisible whipstitch matching the thread to the appliqued piece. Lovely quilts and beautiful fabric! I use a little bit of everything, depending on what look I want. Raw outside edges always get the blanket stitch. 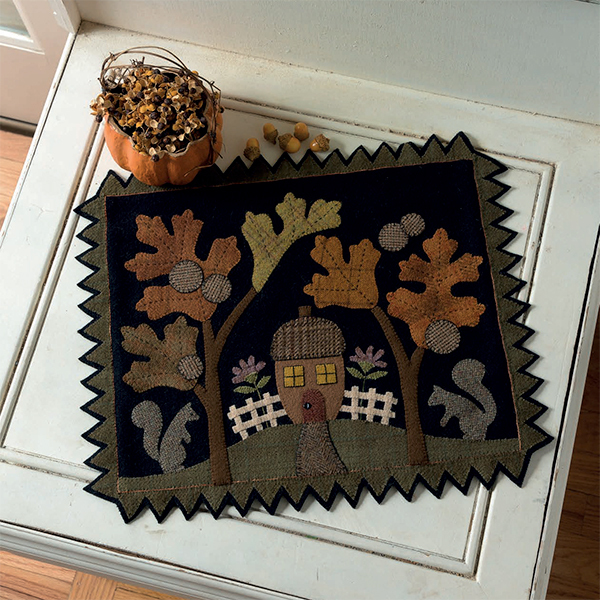 I love the look of wool applique, but have not tried yet. 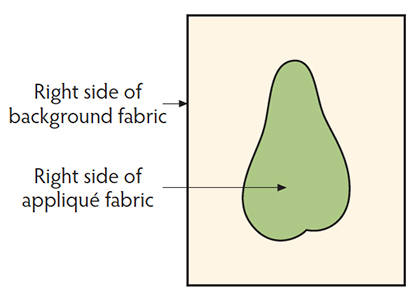 I would do the blanket stitch which I use in all my other fusible applique. I need to start gradually collecting some wool pieces a little at a time. The wool is more expensive than regular cotton. I use a whip stitch, just like Bonnie! I usually always do a blanket stitch but do like to embellish here and there with new stitches learned. This is a fabulous prize .. I gave definitely had my eye 👁 on this very book !! I do a combination of stitches, one a buttonhole and one a whipstitch. I did a whip stitch once on wool. Didn’t like my stitches. I think I would prefer a button hole stitch. But, will I am addicted to buying beautiful wools, I haven’t jumped in yet. Now that I have had my carpal tunnel surgeries, I can take the leap. Would love to win the Maywood Dtudios gifts. Love Woolies flannel! I’ve never done wool appliqué but I’d love to try it! 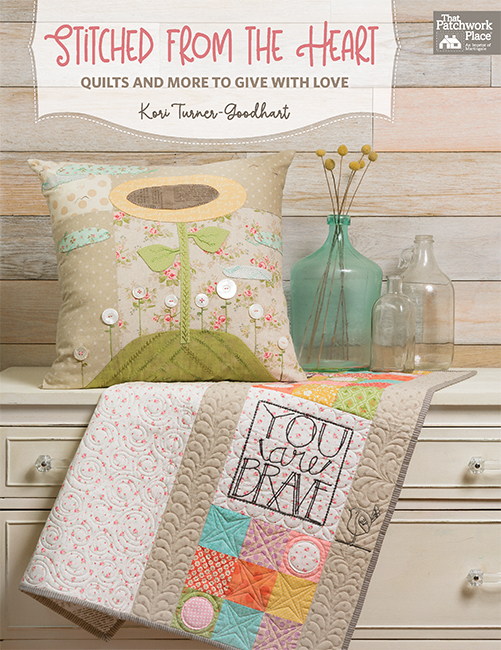 Bonnie’s book and quilts are beautiful. I use a blanket stitch, usually. I love the look of the simple applique stitch & sometimes even use a contrasting color! I use whipstitch, just like Bonnie. I love blanket stitching on wool applique. I do whip stitch when the pieces are very small. Thank you for the opportunity to win this wonderful giveaway. I love the blanket stitch. It was the first stitch I learned from my grandmother. I usually use a buttonhole stitch but am thinking about trying the whip stitch on my next project. I use a blanket stitch but I’m interested to try a whip stitch! I like to use either the whip stitch or buttonhole stitch! I like the whip stitch. Thank you for this giveaway. I love doing the blanket stitch! Thanks for a chance to win! I’ve tried both but prefer the whip stitch as it doesn’t show my uneven stitches. I love doing applique working with wool!When I first started I used only the buttonhole stitch. as I evolved and started doing other applique types and working with other fabrics I now base the decision on how much attention I want to draw to that particular piece in making my decision. A whip stitch with invisible thread lets the fabric shine. Buttonhole stitches make the needlework shine. Thanks so much for sponsoring the give away! I use a whip stitch. Just learning. I never tried wool appliqué but I’m interested in learning. It looks beautiful. I have not done any applique with wool yet, however I have done alot of cotton applique. Using fusible web is how I first learned to applique, eventually moving to needleturn applique as my preferred method. I have been doing some embroidery handwork lately and with colder weather setting in, a wool project would be lovely to work on! I have come to love applique, with both cotton and wool fabrics. I use a whip stich. Just starting to learn, so fsr, I am loving a blanket stitch. Well, I’ve always used a whip stitch, but I think I may try the blanket sitich for something different. Happy Thanksgiving, everyone! I’ve never tried wool appliqué, but I’m ready to give it a try! Been looking at tutorials and getting my nerve to try. I would use the whip stitch. A fascinating technique with the wools. Wow what treats you have for us! I prefer using the blanket stitch. It adapts well to all projects. Wow what a delightful giveaway. I purchased a few small pieces of wool and plan to try wool applique soon. This book has great ideas. I would love to try one of these wonderful patterns as my 1st project. I use both buttonhole and whipstitch when doing regular appliques. 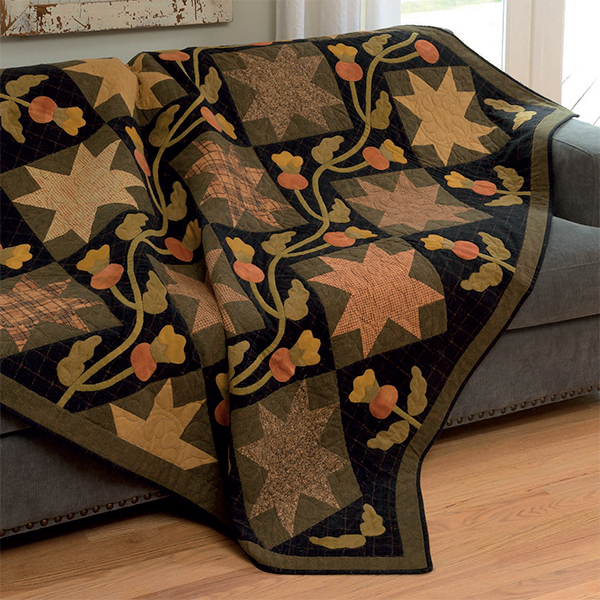 I love the quilts in the book too – my house is done in fall colors. Great giveaway. I’ve never done wool applique but I’m willing to give it a try. Blanket Stitch by machine with Aurifil Lana wool thread or Perle cotton. Love the Woolies line! I use whip stitch just like Bonnie! I haven’t done any wool applique yet, but I am thinking possibly the blanket stitch. Thanks for the draw. I machine applique with my long arm, using the glide foot!! I like using the buttonhole stitch. Whip stitch but I’m just not good at applique. I use both whipstitch and buttonhole stitches. Love Bonnie Sullivan’s fabrics!!! I use both the buttonhole and/or a whip stitch – depends on the project. I have yet to try wool applique, but Bonnie’s book and expert instructions sure make me want to try! I have tried it but the buttonhole stitch just isn’t my cup of tea…so tedious. I’m excited to try the whip stitch..and disappointed that I didn’t think of that myself. I have a small project I’ve been putting off for a couple years..and I’m going to add fusible to increase the ease. Thank you so much. Love the book and doing wool applique too! 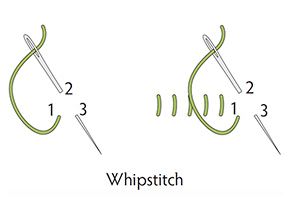 I have always used the whipstitch. It’s easy, quick and sort of soothing! I use other stitches to embellish. I love wool applique and needle turn cotton applique. I’ve never tried wool applique. The little bit of applique I have done has been with a blanket stitch. For me, wool applique would be a new and exciting challenge. In the past I have always used the blanket stitch but I am open to new techniques and am interested in the whipstitch now because of Bonnie. I’ve never tried wool applique but I bought a kit at a quilt show recently. I have a good friend who is very experienced with it and she’s offered to teach me. She uses the fusible method too. I can’t wait to get started. I have done both depending on the look I am going for. Whip stitch is nice for a clean look, wonderful giveaway! I use both, plus some decorative embroidery stitches. It’s so fun! I use the blanket stitch for my wool applique. I have only recently started to do wool applique. I believe I am getting hooked! Would love to win the book for inspiration and techniques. I’ve never tried wool applique, but I’m ready to learn! I have only done one and used the blanket stitch. I loved using the wool and can’t wait to do another one. I like to use the blanket stitch but also like to try different embroidery stitches on the pieces. I love wool applique, and usually use a blanket stitch. Depends on the pattern! Haven’t used wool much…yet! I never tried wool applique, but I’m willing to give it a try. I use both stitches. And currently learning new stitches. I do blanket stitch. Would love to win, it would be a reminder of when I lived in Oregon. I mostly use the blanket stitch. The projects in her book are beautiful, I’d like to do them all! I use both plus embroidery stitches. I use the blanket stitch, but now I am going to try the whip stitch and fusible web. Haven’t done any wool applique but would love to try it. I would use the blanket stitch; love the way it looks on applique. I have not tried wool applique but my friend is crazy for it. I would like to give it a go as she creates some absolutely gorgeous projects. I’ve never tried wool appliqué although I really like how it looks. I haven’t tried it yet but am eager to do it! I use both. Firstly the whip stitch to hold the piece in place and a blamket stitch as an accent. I love the blanket stitch! I prefer a blanket stitch but I’ll have to try a whipstitch! Never thought to sew with a whipstitch. I have been quilting for many years and even teach a couple of classes. I have a nice collection of wool but have yet to make a quilt with wool in it. Now is the time! I usually blanket stitch but whip stitch in some areas. I’m venturing out into other stitches, too. Thanks for the wonderful give-away. I use a whip stitch to anchor the pieces and then I emblellish the edges with a blanket stitch or some other stitch. Love wool applique and Bonnie! The few times I’ve used wool applique I slip stitched around the edges. I guess I need to learn a new technique and would love to do it right way. I use the buttonhole stitch but will try the whip stitch on my next project. I’ve been a big fan of Bonnie’s designs for a long time now and always have a couple works in progress. Keep those designs coming, Bonnie! I use either a buttonhole or a whipstitch, depending on what look I want for the finished piece. 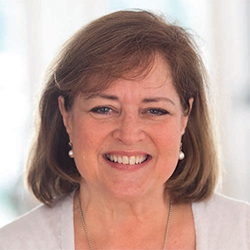 This sounds like another wonderful book from Bonnie! Thanks for generously sharing this technique. I’ve only started one piece, and I used blanket stitch. I may pull it out and switch to whip stitch. I’ve always used a blanket stitch but with the next one I’m going to try the whip stitch. Mostly I use the blanket stitch but I am venturing out into more creative stitches lately! Thanks for the opportunity to win this bundle! Love it. I use both, depending upon the type of effect I want. I use a buttonhole stitch although it takes longer and more thread. I seem to be a traditionalist. I am a new quilter, mostly squares and rectangles with straight sewing. I have never tried wool applique before. This book will give me the push I need to move onto different techniques. Thanks for the giveaway. I have never done wool applique. After reading this and seeing her quilts I would like to try it. The book would certainly be helpful. Blanket stitch. Just getting started with wool applique. Thank you for your give-a-way. I use a blanket stitch or other embellishing stitch to secure applique to background. When I started doing wool applique, I used a blanket stitch, but after seeing Maggie Bonanomi doing it with a whipstitch, I switched. Now, I use a whipstitch, just like Bonnie. I haven’t done too much but usually I use buttonhole. Whip stitch on the tiny items. This is a great giveaway. I like to use a decorative stitch most of the time but, depending on the project, may just use a whipstitch. The fusible web makes managing pieces so much easier. I love.wool appliqué, but often get frustrated with pieces that fray. The flannel sounds perfect! Most of the time I use a Blanket Stitch. If the piece is very small I will whip stitch around it. What a great giveaway. I love the looks of wool appliqué. I use the blanket stitch and love it. I use a blanket stitch as I like how it looks. I must confess that I use both stitching methods depending on what the result is supposed to look like. Either one is done small with the intention of it being nearly invisible. I have never have worked with wool, but have been wanting to try. I love both whip stitch and blanket stitch, depending on the applique – I love blanket stitch for the vintage look. The blanket stitch in black for a folk look! Thanks for the tutorial. I’m just starting to stitch with wool and I love the color in the Woolies fabric line. The blanket stitch was what I’ve been taught to use. A chance in the giveaway is appreciated. I use both whip stitch and blanket stitch….whichever that particular piece calls for. Mostly I use whip stitch on the tiny pieces. I’ve never tried wool appliqué, but I’ve always wanted to give it a try! I use both stitches depending on the size of the piece I am working on and the look I want to achieve. I love Bonnie’s books and I have never tried her flannel and would love too. Thanks for the opportunity to win. This is a dreamy giveaway. I have made little applique ornaments and used the whip stitch but would love to expand to bigger projects. This giveaway would make that happen. I love the projects in the book and the fabrics & projects are perfect to help me learn more and build my skill level to where I could make a big quilt. I like using a blanket stitch. This is a beautiful book. I have made one wool quilt for my son. The methods used in this book seem to make the effort much easier than the ones I used. I have learned the blanket stitch on my Janome is the best. I’ve never tried wool appliqué, but I’m ready to give it a try! I have done the blanket stitch on some of my cotton appliqué quilts. I’ve not done wool applique but I’m drying to. I love the look, I love the folk art designs, and I love the home-y look they bring. I have used mostly blanket stitch but would like to try appliqué. I haven’t done any wool applique (except for a pincushion once) so I would enjoy learning this method. Thanks for the chance to win such a nice prize. Even though I tend to use thread matching my applique I still prefer to use a blanket stitch around wool or any other fusible applique. Love the patterns in the book and hope I win it. I’ve never tried wool applique but am ready to give it a try. I am a beginner quilter and have never tried applique but I am ready to give it a try. Bij vilt en wol heb ik vaak de knoopsgaten steek gebruikt. De laatste tijd gebruik ik vaker de slinger steek. Ik vind deze eigenlijk beter bij het wol appliqueren passen. Translation: I often used the buttonhole stitch for felt and wool. Recently I use the pendulum stitch more often. I actually think this fits better with the wool appliqué. I have not tried wool appliqué but would love to give it a whirl. I like hand work because you can’t take it with you. I use blanket stitch when doing wool applique. I love wool applique. I have always used the blanket stitch. I like that finished edge it gives. But that is just me. I have always used blanket stitch around my applique, but am interested in trying whipstitch. It would probably go around a corner better and be quicker to do. I love the blanket stitch for wool applique. I have not tried wool appliqué, would love to after seeing these beautiful designs! I use both the whip stitch and blanket stitch. Depends how big or small my appliqué is. I’ve never tried wool applique but I’d love to give it a try. I love the vintage look. I have used the blanket stitch but am always up for trying a new technique! I use the blanket stitch most of the time. Would absolutely love to win this prize. I haven’t done any wool applique but I really love the soft, warm look of wool and I like to do hand work so I really should try it! I never tried wool quilts. I would use whip stitch I think. Love hand work. I have used both stitches depending on the size of the work. What a fun bundle! I haven’t tried Wool Appliqué but I’d like to! In the wool applique I’ve done, I’ve used a blanket stitch. Gorgeous book! I have used blanket stitch on wool but recently making some projects with woolies and using whip stitch. I like the whip stitch and will use it again. Depending on the look I want to achieve I use either a whipstitch for a lighter look (using 2-3 strands of floss), or for a more defined look I use a blanket stitch with #12 perle cotton. Either way, I love wool appliqué. Thanks for the opportunity to win such a nice package. I have used both stitches. I like to use a variety of stitches. Please enter me into the contest. I use either a whip stitch or blanket stitch..thanks for the giveaway opportunity! Definitely prefer blanket stitch. Thanks for the giveaway. I’m working on my first wool project and using the blanket stitch. I’ve never tried to wool applique but really want to give it a try. I am sure I will be a life long fan. Thanks for the wonderful giveaway. Since I recently purchased lots of woolen scraps at a quilt show, I’m ready to learn a new skill. I’ve never tried wool appliqué but Iove the look. I love how the blanket stitch looks on wool but I’d like to try the whip stitch. I use the blanket stitch. I like the looks. Bonnie is a favorite, I just love hr designs. I made her monthly Berdie’s Year quilt out of wool and woolies. I am just starting my first wool project using blanket stitch ! I use a long whipstitch as it seems to disappear into the background. Love working with wool and especially Bonnie’s projects. They are so delightful. I’ve never tried wool applique but would love to. All the samples shown are beautiful. Thank you for the chance to try this wonderful art form. Love the ease of using wool. Depends on the size of my pieces and what my project will be used for whether I use a whip stitch, blanket stitch or a hidden stitch. I use blanket stitch for wool applique but want to try whipstitch for my next project. I also want to try using flannel. I won a sample of wools at a Quilt Guild party and am anxious to try. This book would give me the ideas and inspiration. I have only done some small Christmas ornaments in wool and used the buttonhole stitch. Would love to do more- this book would be so helpful! I’ve never done wool applique, but I taught my Mom a blanket stitch for her pillows! I’d love to give it a go! I prefer a buttonhole stitch for my wool work. Thanks for the giveaway! I use blanket stitch but would be interested in learning others. I’ve just started doing wool applique on a small project. I can’t sew the blanket stitch perfect yet, so I sew the whip stitch. Thanks for the giveaway. I’ve never tried wool applique, this would be sure to get me started! I use buttonhole if I want to highlight the edges or give it a more country look. I use a whip stitch if I don’t want the stitching to show. There’s a place for each! And so easy! Love it! It depends on the look I want. Whip stitch like Bonnie if I want the stitching to blend in and blanket stitch if I want a more defined outline. I use both stitches. I love wool applique, and I’ve coveted this book for a long time! Thanks. I’ve used both whip stitch and blanket stitch, depends on the pattern. Thanks! I like to whip stitch but I am also like to use all the stitches in Sue Spargo’s books to embellish my wool applique. I mostly use a blanket stitch – love the look! I usually use a blanket stitch. I would like to try working with wool in applique. Thank you for the tutorial.I have used both stitches in embroidery on cotton or linen. I am ready to try this technique on wool. I use a blanket stitch with wool appliqué. I like a whip stitch best. The designs in the book are wonderful! What wonderful projects. People always say you can’t use fusible with wool, but like Bonnie, I’ve found it works just fine if you press a little longer. I love the woolie flannels, too. Thanks for this giveaway chance! I use buttonhole on most of my wool applique, and I like to add a little embroidery stitching around some of it, too. In fact, I’ve never done wool applique, but it’s so appealing to me so I would like to try it. the blanket stitch, depending on what the design is. My first wool applique was a Bonnie Sullivan design and I got hooked. I use the blanket stitch with my projects but will check out the whip stitch. I have never done wool applique, but I am willing to give it a try. I tend to spend my spare money on cotton fabric and supplies and wool seems like a whole ‘nother way to build a stash and spend. With the fabric, if I win, I would love to give wool applique a try. I love the look of wool. I PREFER BLANKET STITCH. IT LEAVES A NICE DEFINITE EDGE. I have used both whipped stitch and buttonhole jfor wool but have not done as much wool as I would like. I have never tried wool applique but would love to try. My basic go-to stitch is the buttonhole stitch. But like to just use the hip stitch to hold down small pieces. Need to do more as it makes beautiful pieces! I have never tried wool appliqué but can’t wait to try. I either use a whip stitch like Bonnie, or a machine blanket stitch. You don’t have to do it by hand if you have an issue with hand stitching or have arthritis like I do that takes away the fun of handwork. I usually have used a blanket stitch when appliquing with wool. Lately, I’ve been using a whip stitch especially when stitching tiny pieces! This giveaway has such beautiful colours that I haven’t found before. So exciting! I use the whipstitch. I learned this technique in a class that I was lucky enough to take with Kim Diehl!! I haven’t tried wool applique yet, but I love wool and would like to learn. These patterns look amazing! Whipstitch and blanket stitching are what I use for wool applique. I use the blanket stitch, but embellish with other stitches! I mostly use the blanket stitch, but look forward to trying the whip stitch! I am definitely willing to try this technique! Wonderful-looking projects that my family would enjoy sharing. Thank you for the opportunity!